King Charles III (2017) - Sci-fi-central.com. UK  2017  88m   Directed by: Rupert Goold.  Starring: Tim Pigott-Smith, Oliver Chris, Richard Goulding, Charlotte Riley, Margot Leicester, Tamara Lawrance, Adam James, Priyanga Burford, Tim McMullan, Katie Brayben, Nyasha Hatendi, John Shrapnel, Parth Thakerar.  Music by: Jocelyn Pook. A speculative, fictional ''what if'' scenario based on the controversial play of the same name in which Prince Charles becomes King Charles III following the Queen's death. His scandal-prone family schemes against him, as his controversial political decisions cause constitutional crisis and lead to chaotic riots and army in the streets. Some of the most shocking moments in the story include power-hungry Kate planning to take Charles down, Harry's relationship with a black Republican girlfriend, Camilla slapping her stepson and the ghost of Charles' late wife Princess Diana appearing to her children to give them council. It is that question that lies at the heart of all storytelling. No matter the medium, no matter what the genre, it all comes back to that same basic question. 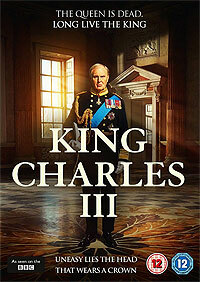 King Charles III is no exception that rule. Indeed it is a prime example of it being a self-described "future history play" in the words of its writer Mike Bartlett. Adapted from his 2014 stage play for the BBC and shown here in the United States on PBS, the TV film adaptation is an interesting piece of work to say the least. The basic premise is a simple one. After a lifetime of waiting to be crowned king, Charles finally takes the throne. His reign though is not to be a peaceful one as Bartlett imagines the crisis that breaks out when the new king finds himself caught in a moral quandary regarding a law he does not agree with that could damage the freedom of the press. Given recent events on both sides of the Pond, it's a story that has that eerie sense of being on the cusp of reality despite being something of an alternate history work. More than that, Bartlett takes in the notion of Shakespearean tragedy along the way as well with themes familiar with anyone who has ever experienced any of the plays dealing with English history. Plus, it's given that extra added something by Bartlett's dialogue. Taking the themes of Shakespearean tragedy one step further, the dialogue is written and performed in blank verse. The result may be jarring for viewers not expecting it but no one ever drops a "thou" or speaks in too anachronistic a fashion that it becomes implausible. Indeed, once one's ear attunes to it, it makes for an interesting experience as Bartlett gives Charles soliloquies to speak and character's express their thoughts and passions in ways the viewer is not likely to expect. The result further reinforces the idea of a "future history play" in the Shakespeare tradition. There's also some fine performances on display as well. The sadly late Tim Pigott-Smith in the title role dominates from the moment he gives his first soliloquy right through to the very last shot. Pigott-Smith plays Charles as a man born into duty finally given the chance to fulfill his perceived destiny only to be caught in a quandary that is part moral and part political. The past is never too far for Pigott- Smith's Charles, haunted figuratively and perhaps literally by the spectres of the two major women in his life and the question of what the role of a monarch is in today's world, something that the actor brings to life superbly. It is an extraordinary performance and one that stands as a fine tribute to the late actor. The supporting cast is strong as well with many actors involved in various productions of the play playing roles. Oliver Chris and Richard Goulding play the Princes William and Harry who find themselves caught up in events and trying to find their own way as a result. There's Margot Leicester as Camilla and Adam James as the fictional Prime Minister both reprising their stage roles while the gender swapping of a role gives actress Nyasha Hatendi the chance to play Stevens, the head of the Opposition party in Parliament. The biggest surprise though comes from an actress not previously involved in any other production of the play: Charlotte Riley as Kate Middleton. Riley packs in a surprisingly powerful performance including a major monologue that draws parallels with one of the Bard's greatest female characters (a role that I find myself now wishing for Riley to play). The results as solid across the board. Between Bartlett's script and the performances, King Charles III makes for a solid piece of drama. It also stands as a fine example of how to bring something from the stage that could be perceived as too highbrow and adapt into a new medium. It also stands as tribute to a fine actor who left one final, amazing performance behind. Or to put it another way: it is well worth a watch if you've got the ninety minutes to spare. Review by timdalton007 from the Internet Movie Database.